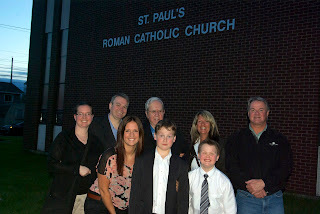 Son and the Holy Spirit'"
Do you remember going to confession. Our class would march over to the church for confession once a month, some times more often. We would line up for our turns, trying to remember the sins we might have committed since our last visit. One by one we would take our turns entering the confessional, beginning in the dark by saying "'Bless (or Forgive) me father, for I have sinned, it has been two weeks since I confessed and these are my sins .." Most of the time the sins were things like not respecting my parents or a scattered curse word. We would be absolved and given a penance. Of course, we compared our penance and figured out who had more sins by the number of Hail Mary's the priest dolled out. Confession was a big deal because it was bestowed by the Bishop himself. That usually meant that a helicopter would pitch near the school. That was as thrilling as the sacraments. 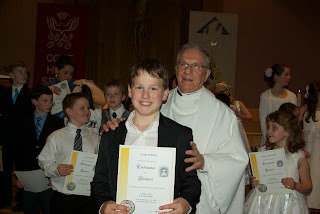 Liam and Conor were given the sacraments of Confirmation and First Communion yesterday evening. First Communion and Confirmation are important rites of passage in a Christian's life of discipleship. 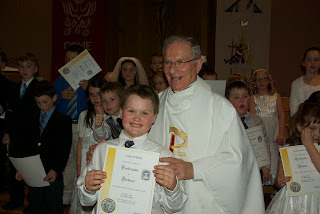 Children who are ready to affirm their own faith, reaffirm their baptismal vows as servants of Our Lord. 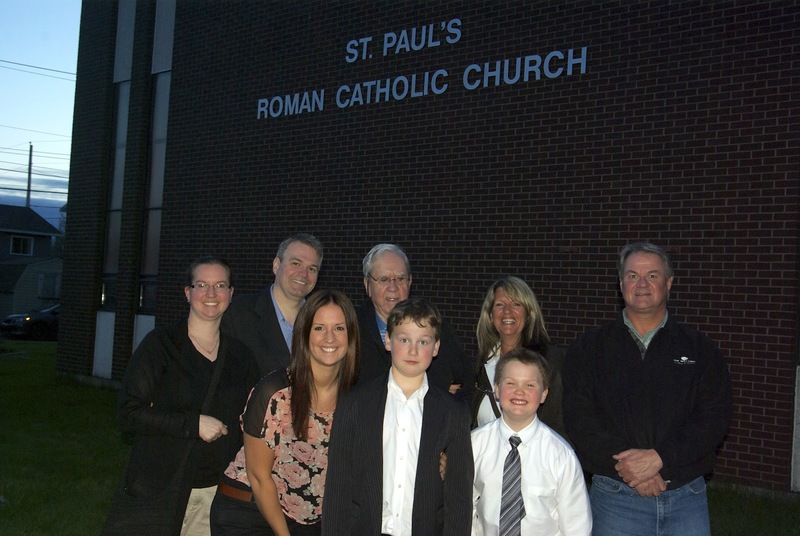 Today, most children make their First Communion immediately after they have been confirmed. It used to be that confirmation was third. I think our concept of sin, mortal and venial and handling a sacrament of confession should come at a time when children are older, like it used to be. The essential element of the confirmation is the anointing of the confirmand with chrism accompanied by the words "Be sealed with the Gift of the Holy Spirit" . This seal is a consecration, representing the safeguarding by the Holy Spirit of the graces conferred on the Christian at Baptism. It increases and deepens all of the graces given in Baptism. Liam noted that aromatic oils smelled like his baptismal blanket! Conor has been chaffing at the bit to taste the host and taste the wine. After months of special classes and preparation he did both last night. Tonight Aidan will have his first confession. He has learned his act of contrition and understands his conscience, as good as one can at 12. Like last night, there will be a special service for the children and their families prior to hearing confessions. Some parishes open the confessions at that time for every Catholic there -- not just the children -- and it is a wonderful example for children to see the grown-ups they love and older siblings go to confession at that time as well. I told Jess she had to see the picture of you from your first communion. So she goes on the article and is reading it until she gets down to the picture. When she arrives I say, "Look at Peter." The mouse goes to the girl in the white to the right of you and she says, "Him?" When I start laughing and say no the other one you fool she defends herself by saying, "I don't know what they used to do in the olden days." You can hang it over her head the next time you see her.